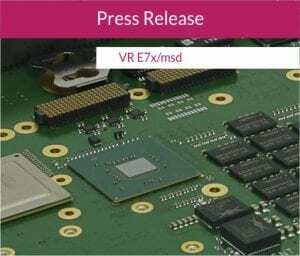 Concurrent Technologies launches VR E7x/msd, a new 6U VPX™ computing board based upon the newly announced launch of the Intel® Xeon® processor E-2176M (formerly known as Coffee Lake-H). Supporting 50% more processor cores within the same power envelope, the Intel Xeon processor E-2176M has six-cores compared to previous generation quad-core processors from the same product family. In addition to the launch of VR E7x/msd 6U VPX board, Concurrent Technologies is introducing the same processor across a number of other form factors including VMEbus. Further announcements will follow as boards are officially released. 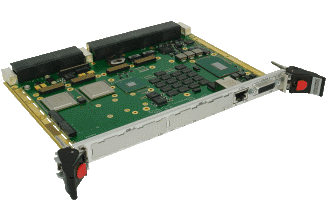 In addition to improved processing capability, VR E7x/msd includes the option of front panel mounted USB 3.1 ports, 10 Gigabit Ethernet connectivity, enhanced storage options and improved digital graphics outputs. Direct attached storage options include a SATA flash disk and two M.2 modules. These utilize PCI Express® connectivity and NVMe support for a high capacity solution that is suitable for use in challenging environments. VR E7x/msd is designed to fulfil a system management role for high performance 6U VPX processing solutions and so includes the option for dual XMC modules to support I/O expansion. Initial shipments of the product will be air-cooled, with production quantities expected in Q3. A conduction-cooled version designed to meet an operating temperature range of -40°C to +85°C will be available after further qualification testing. Initial operating system support will be for Linux® and Windows® with optional support for others such as VxWorks® will follow based on customer demand. Keep up to date with our latest news and posts via our Company LinkedIn page.